If there’s one problem that has plagued nearly every amateur who’s ever tried to set up a top-tier Christmas light display, it’s what to do with extra light line. You don’t have to be a pro to notice it in your own neighborhood: Those points on an otherwise perfectly lit perimeter where the installer suddenly realized their string was several feet too long, trailed it down from the rooftop, and crammed the excess behind the bushes hoping nobody would notice. It’s a big, glowing blemish on millions of otherwise excellent displays every year, yet most folks assume it’s just a necessary evil. But actually, you don’t have to let haphazard trailing light line muddy the clean, vivid presentation of your Christmas light display. All it takes is a little know-how, a DIY ethic, and the easy-to-use secret weapon of professional installers everywhere: C9 bulk light line. You see, the tools you’ve likely been using this whole time — C9 stringer light sets — aren’t quite suited for perimeter lighting. In the same way you can’t fit a square peg into a round hole, you’ll never be able to achieve the crisp design of a professional display with readymade light sets. 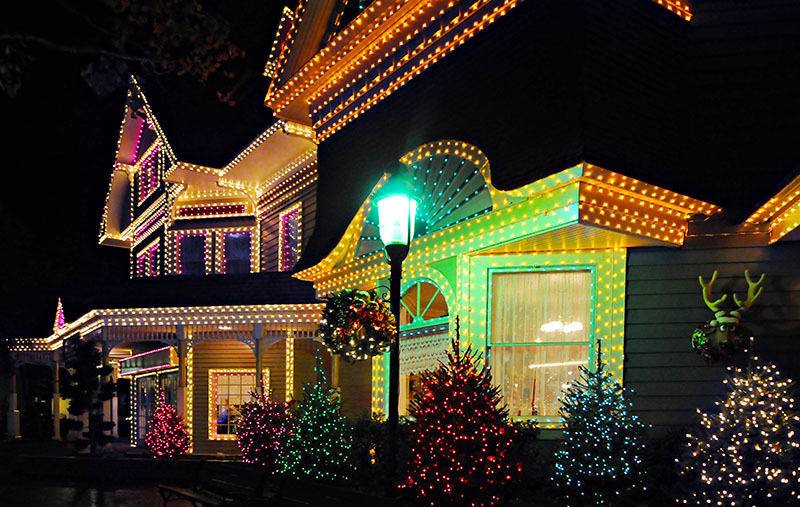 Read on for the difference between C9 stringer light sets and C9 bulk light line, why it matters, and how you can leverage both their advantages to build a light display that will dazzle the whole block. Stringer light sets are the immediate go-to for many homeowners. They’re sold in fixed lengths, with a male and female plug on either end, complete with bulbs already molded into the sockets. Since they’re completely self-contained, they’re typically seen as the “no-fuss” option for amateur perimeter lighting. In addition to having bulbs that are molded into the socket and are not able to be removed or replaced, you're also dealing with less illumination from the bulbs. Stringer sets use a single LED diode, which offers lower illumination output than C7 and C9 replacement bulbs. Pro grade replacement bulbs contain advanced SMD LED chips that produce up to 60% more illumination intensity. Certainly, stringer Christmas light sets are simple to use. All you do is buy a few sets, clip them along the perimeter, and plug them in. The problem arises when you inevitably end up with too much or too little line remaining when setting up your display. You can try and hide the gaps and trailing lines all you want, but these are lights we’re talking about — they’re going to be obvious. Any professional worth their salt wouldn’t be caught dead leaving a rogue string sticking out from one of their displays. That’s why they never use stringer light sets for perimeter lighting, instead opting for C9 bulk light line. When homeowners look at their near-perfect light displays and compare them to the professionally-installed display down the road, they often imagine there’s some complicated, expensive combination of techniques and equipment involved. But actually, for the most part, it all comes down to the fact that pros use C9 bulk light line for all their perimeter lighting. ...and you’ve got a light set tailored precisely to your needs. Attach them to your home with the right clips, and you’re good to go. Setting them up is as simple as it sounds, and ultimately results in a pristine, professional-looking appearance that can’t be beat. And if you’re after a smaller bulb than the C9, C7 bulk light line is an excellent alternative. If you’re serious about your Christmas light display, you need to do as the professionals do. That means switching out your old stringer light sets with custom C9 bulk light line, cut to size. Take the DIY plunge and you’ll be amazed at how much of a difference it will make. When it comes time to step out to the sidewalk and bask in your handiwork, you’ll rest easy without a single light out of place — and with no lingering disappointment at being outdone by your neighbor!